Schooner Dallinghoo charters out to parties of up to 8 guests offering a sailing holiday of a lifetime around some of the least explored areas on the planet. 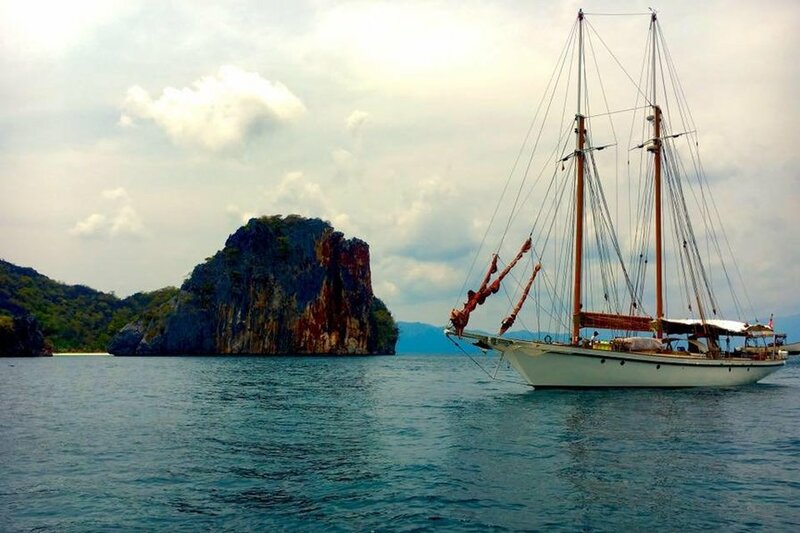 Spending between November and April in the Andaman Sea, sailing: Burma, Thailand, Malaysia and the Andaman Islands. Then between May and October she is in the South China Seas sailing: Borneo & the Philippines. Guests enjoy a modern well-appointed interior with all the ‘creature comforts’ but in a vessel styled by the sailing yachts of a time gone by. The interior styling is light and bright with just the right amount of varnished teak, the electrics are modern and she is full air-conditioned throughout the interior. There are energy efficient LED lighting in all areas and all plug sockets throughout have the addition of two USB charging points included so there are shortages to charge your camera or phones etc. and are 220v AC. In addition to the air-conditioning all bunks have fitted quiet running wall fans and large hatches with fly screens, this does enable the option should guest wish to sleep without AC or generators running with the natural air flowing through. Schooner Dallinghoo offers to the charter guests some flexible accommodation options, she has in the main guest section: 5 cabins, 4 double cabins and 1 twin cabin. You will see on the plans that one cabin is listed as the ‘Captain’s Cabin’ however this is fitted out to the equally high standard as the other cabins and if guests prefer the captain and his wife can move to the twin cabin to allow the guests the use of 4 double cabins. The ‘Master’ cabin and ensuite takes up the full width of the aft section of Schooner Dallinghoo, this cabin is spacious for a yacht of this size and type and has fitted a double bed and with a 32” LG Smart TV. The ensuite facilities include:- shower, toilet and basin and there is plenty of storage space. The ‘VIP’ cabin is on the starboard side of the main saloon and has is fitted double bed and with a 32” LG Smart TV. The ensuite facilities include:- shower, toilet and basin and there is plenty of storage space. The two forward cabins consist of one double and one twin both having their own ensuite facilities including shower, toilet and basin and there is plenty of storage space. Through the vessel in all the ensuites facilities we have pressurized hot and cold water and all toilets are Vacuflush, a system that is considered the best available. The main saloon has seating for 8 around a teak dining table, this has fold up leaves for dining but are stowed the rest of the time to allow more comfortable seating here the guests can view the 42’ LG 3D Smart TV. On board we have a digital library of over 2,000 movies and 2 terra bytes of TV series and documentaries so should you wish for a quite night in front of the TV there is no shortage of viewing material. The hull extension work in 2015 was primarily to create a large aft deck, a deck that can be used for dinning and relaxing. Here there is a teak table with seating for 8 guests, plus other causal bench seating. This area has a full awning which allows shade from the sun and shelter from any tropic showers while at anchor, there is a BBQ attached to the aft rail and the fresh catch of the day can be barbequed in full view and straight to the table. Forward of the aft deck we have a more cosy cockpit with seating again this has a full awning which offers shade while sailing or at anchor. The coach house roof forward of the cockpit at deck space for sun bathing, forward of this are the diving lockers and foredecks with the anchor windlass and the bowsprit. When guests choose they can have as much fun off Schooner Dallinghoo as they do on her with her well-equipped inventory of sports gear. We have a 3.9 meter RIB (rigged inflatable boat) fitted with a Yamaha 20hp four stoke engine, this tender is used daily for most running around, shore trips or beach landings along with snorkelling and diving excursions. Our 2nd tender is a 12ft classic gaff rigged sailing dinghy, she was designed to be equally good at sailing as she is at rowing and comes with oars to be used as a traditional rowing boat or can be rigged with mast and bowsprit and has both main and forward sails offering hours of fun sailing around the anchorages and the islands etc. We have a pair of Hobbie Mirage Kayaks, these can be paddled as a normal kayak but also have fitted a set of peddles so these can be used for additional or sole propulsion. We have on board two diving compressors, the main compressor fills at 140lts per minute and two cylinders at a time, the 2nd compressor is a portable petrol back up which can be used ashore if remote filling is required on diving excursions. Schooner Dallinghoo has 8 completes sets of diving equipment for guests use along with additional snorkelling equipment. NB:- If any guest wish to go diving then this should be discussed at the time of booking, diving is free of any additional charges and is available for any qualified person. However all diving needs to supervised and accompanied by a ‘dive-master’ / ‘dive-leader’ or similarly qualified person, should none of the guest party be of this qualification or above then, a dive master will be brought aboard and this will be an additional cost – charged at cost. Original certificate is required on board and an email copy should be provided beforehand to avoid complications when on board. Log books required recent diving history should also be available to see. There is an array of fishing equipment for both trolling for big game while under sail or motoring and light weight rods for fishing while at anchor or from the dinghy around the reefs. There is nothing better or tastier that eating your own catch a few hours after the joy and excitement of catching it!